Here is my One Tribe Apparel pants review. 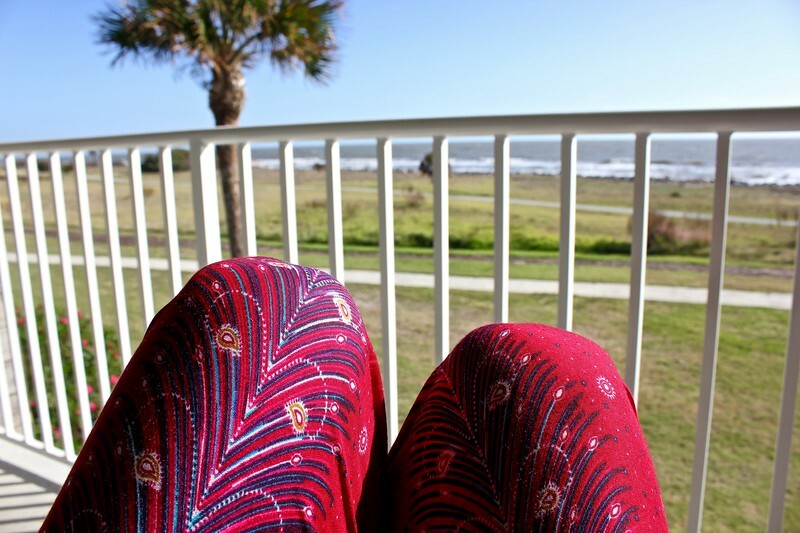 I’ve been wearing the ethically produced boho harem pants for a few months now, and I’m hooked! When I was backpacking throughout Southeast Asia a few years ago, one thing I could be sure of – no matter if I was in Thailand, Vietnam, Cambodia, or Malaysia – is that I would see “elephant pants” for sale in a tourist clothing store and souvenir shop. Of course I was tempted to buy a pair for myself, since it seemed that almost every other female backpacker had at least one garment made from bright, flowy fabric dotted with elephant figures. After all, they’re affordable on a backpacker’s budget, they’re the perfect weight for the steamy temperatures, and they’re long enough to wear in temples and conservative areas. In January I brought my pants to sunny Miami with me. But as someone who tries to live – and travel – as responsibly as possible, I was able to resist temptation by reminding myself that I didn’t know where these pants were made or how they were produced. Due to the cheap cost, I was concerned that they were mass produced in factories that were not ideal for workers or the environment, and might fall apart after a few wearings and washings. 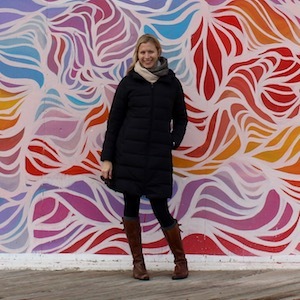 Because the image of “elephant pants” is linked so closely with this meaningful trip, I was thrilled when the ethical fashion company One Tribe Apparel asked me to try out a pair of its bohemian harem pants. One Tribe Apparel has a variety of pants, bohemian – or “boho” – harem and Aladdin styles as well as shorts and leggings. 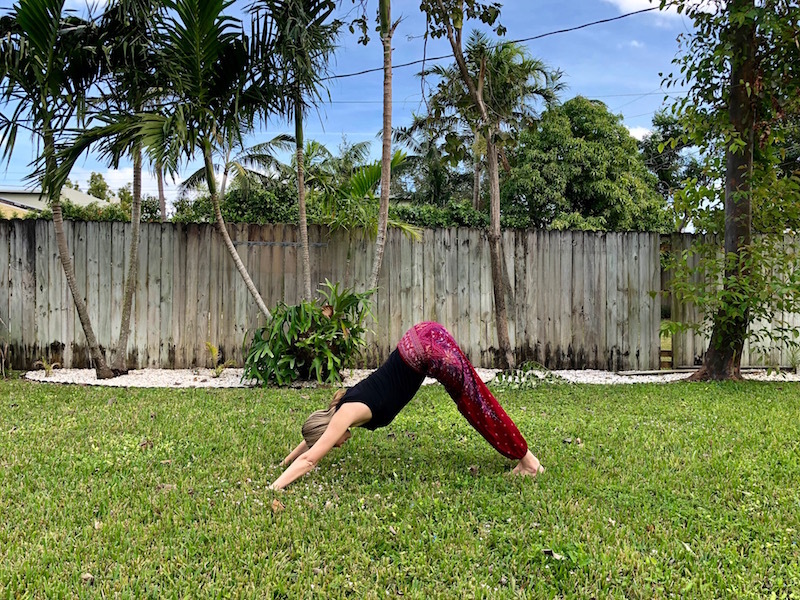 The boho harem pants are made from 100% bamboo rayon, and come in seven different designs and more than 50 prints. Needless to say I had a really hard time deciding on the specific pair I wanted, but I settled on Coral Pink Peacock. One Tribe Apparel was started by a couple – an American man named Mitchell and a Thai women named Fai – in the hills of northern Thailand, where they met in 2013. They were inspired by the natural beauty of the area and wanted to capture the “spirit of artistic community and collaboration” that exists there. Today they share that bohemian vibe with the world from the company’s Chiang Mai headquarters. All of the One Tribe Apparel pants are handmade using traditional techniques and local materials. $1.00 from each sale of all of the company’s elephant-themed products – pants, yoga mat straps, shorts, and kimonos that feature traditional Thai artwork – is donated to the Elephant Nature Park in Chiang Mai. 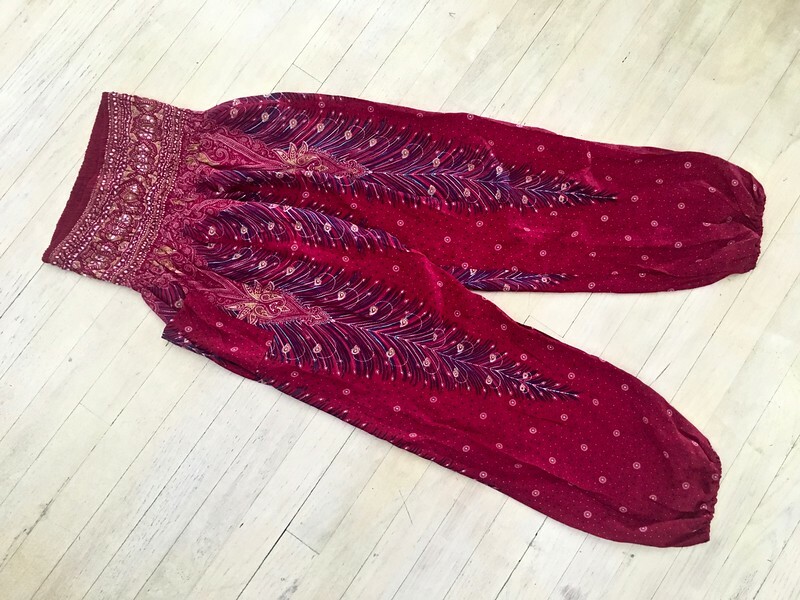 The first thing I noticed when I took my harem pants out of the package was the rich color, which was much more a deep raspberry than coral, but I thought it was stunning. They felt silky smooth to the touch, and you can tell right away that they are made with great care from high-quality materials. I had been a little worried about the fit because the pants only come in two sizes – standard (U.S. size 0-12) and large (U.S. size 12-16). Since I’m 5’9, I thought the standard size would be too short for me, but they actually fit quite nicely. The wide elastic band on the top is flattering on my tummy, and the pockets are definitely a nice touch. Over the past few months that I’ve worn the pants, I’ve found them to be incredibly comfortable and versatile. They have become my go-to loungewear and pajamas when traveling to warmer climates, especially with friends, since the pants are much nicer than what I wear around my own house. 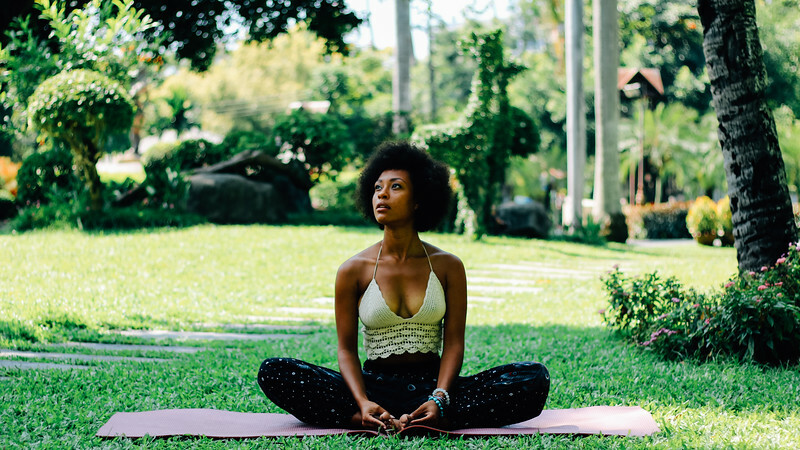 I’ve also recently gotten back into a consistent yoga practice, and the pants provide a more attractive alternative to leggings and are still easy to move in. I pair them with a simple black tank top. On a practical note, I was pleased to learn that One Tribe Apparel offers free shipping on orders $60+, and U.S.-based customers receive their shipments in two-to-four business days. 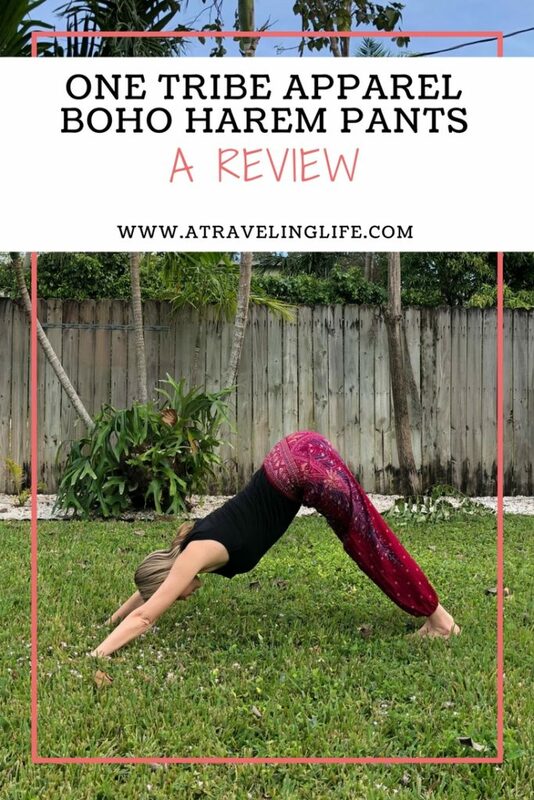 For the purposes of this One Tribe Apparel pants review, I was provided with a pair of the $28 boho pants. This post contains affiliate links.